Your adventure begins on Friday and we want to remind you of some very important information that you need to make it to Fort Lauderdale for the Power Cruise sailing. This is one of several messages that you will receive over the next two days – you should also receive a call and a text message. IMPORTANT UPDATE – Due to the Government shutdown airports are experiencing longer than normal wait times to pass through security. We are asking that you plan to arrive at the airport no later than 2 hours prior to the departure of your flight. Some reports are recommending 3 hours prior to departure, but no less than 2 hours. If you miss your flight due to a TSA security delay, you may incur, and will be responsible, for flight change fees. So please plan appropriately for this potential delay. a certified copy of your birth certificate and a valid Photo ID (Driver’s License, Military ID, State ID, etc). Please try to have your printed Set Sail Pass and Royal Caribbean luggage tags with you before you leave for Ft Lauderdale. If you haven’t completed your Set Sail Pass registration, please Click here to begin the registration. If you need any help with this process, please call 800-376-2504 and someone will help you. When you arrive at the Ft Lauderdale airport, follow the signs to go to the baggage claim area and look for the Power Cruise Representatives. They will be wearing Power Cruise t-shirts and holding signs that look like the image here. If you need any information or have any questions prior to or during your travel, please call us at 844-383-8615. 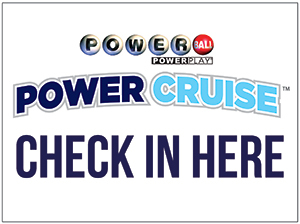 We look forward to greeting you in Ft Lauderdale and sailing with you on the 2019 Powerball Power Cruise.